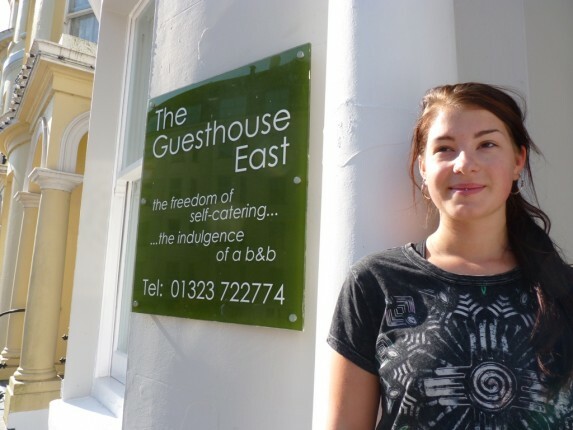 The guestlist is often a creative crowd here at The Guesthouse East in Eastbourne – popstars, actors, DJs and even the odd politician (creative perhaps being one of the more favourable terms you could use) – and whilst she has yet to achieve celebrity status Emmeke Megannety might one day hit the headlines. Emmeke is a popular member of our house-keeping team and is currently studying for her A-levels. ‘After spending days and days struggling to think of material to write that advertised my home town of Eastbourne, it dawned on me that I was looking at the seaside town from the wrong perspective. It was only when I began to ask this question to my boyfriend – who lives in a village further inland and had previously only been to Eastbourne on rare occasions and got incredibly excited when he discovered all that the town had to offer – that I realised, for a tourist or visitor of Eastbourne, it was a hub of fantastic opportunities suitable for families, teenagers, adults and the elderly. Upon arrival into Eastbourne, the town sign describes it as the “The Sunshine Coast”. Considering this is England we are in, it’s questionable just how much sunshine we are subject to. But Eastbourne is still able to cater for you no matter the weather conditions. The town centre holds a variety of shops within its Arndale Shopping Centre from clothing stores such as Topshop to craft stores like The Works. Happy shoppers can be found all day long bustling about the town centre, fulfilling their materialistic urges, making their bank balances cry in the process. A suitable number of cafés and sandwich bars are located around the town centre, making a coffee break at Costa or a catch up over a slice of cake at Patisserie Valerie always a favourable option. For theatre lovers like me, Eastbourne is home to four beautiful theatre houses which show performances of all sorts – from dramatic thrillers to west end musicals to comedy shows – all year round. And should you prefer the digital screen to real life performance, there are two cinemas always showing the hottest films at great prices. The seaside resort also holds possession to parks and forestry as well as the South Downs which provide a beautiful landscape for strolls, runs or cycle rides for those who enjoy the great outdoors. Not to mention the miles and miles of pebble beach that spreads across the towns coast, ending at Holywell Wish-tower with its lucky fountain whose water can bring good fortune to those who drink from it. Also found along the coasts promenade are the family friendly play areas – Treasure Island and Fort Fun. Both offer indoor soft play, outdoor rides and water park activities for the children and outdoor mini golf ranges for the rest of the family. Great fun for everyone! To top that all off, with a fantastic range of hotels and bed & breakfasts with stunning coastal views – such as The Guesthouse East, situated along the seafront – a room is always available, whether your trip is spontaneous or has been planned in advance.